House Tipster was on-site during the Dwell on Design event in Los Angeles, which celebrates modern design and architecture. Dwell on Design, considered THE ultimate modern design fair on the West Coast, just wrapped up after an impressive 4-day run from April 4th through the 7th at the Los Angeles Convention Center. The event is hosted by the publication dwell and is sponsored by many well-known leaders in the design industry including House Tipster. Ultimately, Dwell on Design brings the best and brightest designers and product representatives together to celebrate and collaborate on all things “modern design,” including furniture, decor, home technology, outdoor living, and other design materials. Although it sounds similar to other design industry trade shows, Dwell on Design sets itself apart from the rest by providing a full-fledged sensory experience for attendees, who are both trade professionals and the public. For example, instead of focusing on breakout continuing education classes, Dwell on Design is all about keeping the educational components of the event on the main floor. This includes all the featured speakers, exhibits, large-scale activations, and even the private, professional consultations. The result of keeping all activities easily accessible is an industry event that looks and feels like a reunion. Designers share inside jokes with their peers, buyers meet up with their favorite product reps, and everyone is eager to check out the latest, mind-blowing technological offerings. Plus, everyday people who aren’t necessarily in the industry but who share a passion for modern design, referred to as “design enthusiasts” by Dwell on Design event manager, Amie Gilmore, are also there to learn and participate. Simply put, it feels like home. What was House Tipster’s role in all of this? Besides becoming a Sponsor for the popular event, House Tipster took the long journey from New Jersey to LA for two reasons. First and foremost, we were there to present our state-of-the-art virtual technology. As you may know, House Tipster is committed to providing homeowners and professionals like you with a full range of home improvement resources. Our main offering is our advanced Virtual Room Technology, which is designed to make creating the home of your dreams easy and convenient. 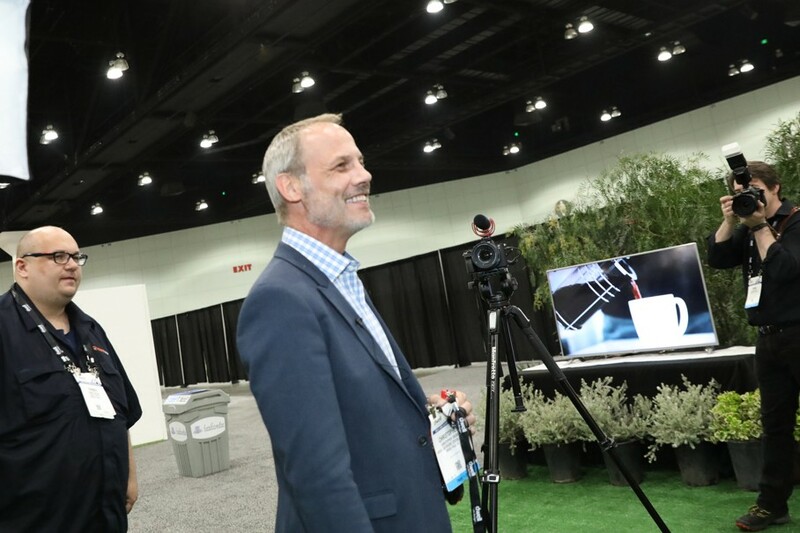 We setup our virtual design tools at booth # 1201 of The Design Space, and there, we gave Dwell on Design attendees a chance to navigate our program themselves. We had a spectacular time talking with people about the tools they use to design their own spaces, and how House Tipster can help them in the process. To check out the video of our live coverage from the booth, follow this link. And when you get a free minute, try a Virtual Room out yourself! The second reason we headed to Dwell on Design is that we’re, for lack of a better term, obsessed with design. And because we know you share this passion along with us, we strive to bring you all the news you need to stay informed and make design choices that benefit your life. This means interviewing world-famous designers, manufacturers, and other knowledgeable spokespeople about the trends they’re seeing, the technology they want, and the innovations they’re bringing to the table. Over the coming weeks, be on the lookout for video coverage of our exclusive interviews with industry professionals such as Matthew Hofmann with his creation (and Dwell on Design standout installation) The Living Vehicle, Brian Abramson of Method Homes, interior designer and TV-personality Jennifer Farrell, PR pro Christine Anderson, and more-- all on our Tipster TV channel. You can also follow our media page for interview snapshots and our new Designer Spotlight series. As you can see, 2018 Dwell on Design was a special event and one that we look forward to every year. We hope to see you on the floor of the LA Convention Center with us next year!